An outdoor church sign lets the world know that your church is there. Signs can come in a range of shapes and sizes and with a variety of different technical elements. 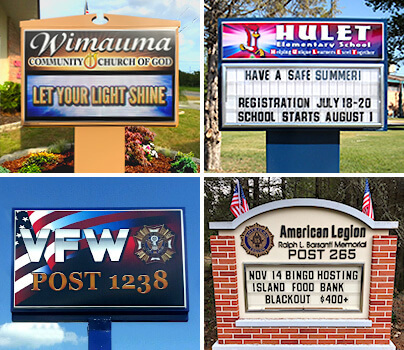 Ultimately, you get to decide the best way to use signage in front of your church, but to help you narrow in on the right option for your faith community, here's a look at the most common types of outdoor church signs. The fifth book of Matthew contains the Sermon on the Mount, arguably one of Jesus' most important sermons. During this sermon, Jesus said that the poor, the meek, and those who mourn are blessed, but he also emphasized the importance of letting your light shine. "Let your light shine before men, that they may see your good works and glorify your father in heaven" Matthew 5:16. Generally, this sentiment is metaphorical. You let the light of Jesus shine throughout the world by what you do with your ministry, but to let the community know about your ministry, a light box sign can help. These signs feature a static message. You work with our designers to create visuals that work for you; most churches choose to include their church name as well as a logo, background colors, or other design elements. Then, a light shines from the inside of the sign, illuminating the design and ensuring that your church's message is visible both during the day and in the evening. Like a light box sign, outdoor LED signs are also visible at all times thanks to their lit-up designs. However, rather than having a static message, these signs feature a large LED screen that can feature a host of changeable messages. You can program messages to appear at different times on your sign which allows you to easily share Bible verses, put up humorous quotes, invite the community to special events, announce service times, or post other messages. You can even post short videos or integrate other media into your sign. With an outdoor LED church sign, you can opt for a standalone LED screen, but most churches choose a blend of a light box sign with an LED screen. Typically, the light box portion of the sign hosts your church's name and any other details you want permanently displayed. Then, the changeable LED part of the sign exists next to the light box section. You can have these signs close to the ground, mounted onto the outside of your church, or situated high on a pedestal so they can be seen from blocks away. If you want to mirror this technology inside the church, LED walls and signs can also play a host of functions inside your church in classrooms, communal areas, and in the sanctuary itself. If an LED church sign is not in the budget, an outdoor changeable letter sign lets you vary your messages at a more affordable rate. When you look through books or blogs online about humorous or engaging church sign messages, changeable letter signs tend to be the most common type of sign featured. Like the other types of outdoor church signs, these signs can also be displayed at different heights, and they come in a huge range of sizes. Generally, the background of these signs is white. You choose the message you want to display, then spell out the message using letter tiles. You can also integrate other elements with these signs. Most popularly, you can choose a light box sign to showcase the name of your church and then the rest of the sign can be set up for the changeable letter display. Depending on your preferences, you can opt for an expanded message area that lets you post long messages, or you choose a larger space for your static message that has plenty of room for graphics. This flexibility allows you to get the best signage for your situation. Monument signs are the perfect way to add a layer of prestige to your church sign. The word monument applies to the style of these signs. In particular, they feature a masonry-inspired frame that looks like it is made of bricks. If you want a sign that matches the classic exterior of your brick church or if you like the idea of a stately sign next to your wooden church, a monument sign may be the answer for you. You can encase an LED screen in a monument style sign, or you can opt for a more simple design that has a changeable letter board or a light box display inside of the brickwork. We can help you decide what's right for your situation, and you can work with our designers to ensure the sign meets your specifications. Ready to spread the good news? Looking for ways to communicate more effectively with your church members? Longing to reach the community at large? Just want to make sure the world knows that your church is right there? Then, you need outdoor church signage. At Stewart Signs, we are one of the country's leading providers of signs to churches, and we also provide signs to schools, municipalities, and other organizations. To learn more and to get started on a custom quote for your perfect sign, contact us today. We look forward to helping you.